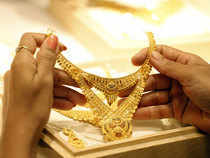 LONDON: Gold prices will average less than $1,300 this year as resurgent appetite from investors and central banks is offset by weaker jewellery demand, a GFMSRefinitiv report said on Wednesday. In 2018 gold fell for the first time in three years as rising stock markets and higher U.S. interest rates offered better returns and a strong dollar made the metal more expensive for non-U.S. buyers. But fears that the global economy is slowing have revived interest in gold and led to expectations that U.S. Federal Reserve will pause its rate rises, bringing back investors and lifting prices to eight-month highs just above $1,310 an ounce. “We expect gold prices to continue to benefit from continued economic uncertainty and a slowdown in the U.S economy,” GFMS analysts at Refinitiv said in a quarterly report. “(But) physical markets are likely to be subdued due to the higher price level,” they said, predicting that gold would average $1,292 an ounce this year. That would be a little higher than last year’s average of $1,268 but below the forecasts of $1,305 an ounce for this year and $1,350 for 2020 in a Reuters poll of 36 analysts and traders published on Tuesday. Jewellery consumption in the fourth quarter of 2018 was 560 tonnes of gold, down 3 percent from the same period in 2017, the GFMS Refinitiv report said, while retail investment declined by 3 percent year-on-year to 296 tonnes. Exchange-traded funds, however, added 114 tonnes to their holdings over October-December and net purchases by central banks more than doubled compared to the fourth quarter of 2017 to 196 tonnes, it said. For the two largest gold-consuming countries, China and India, the report said Chinese jewellery demand was likely to decline this year as the country’s economy slowed and Indian demand would continue to fall.